Interactive website helps older male patients decide whether to take up the offer of abdominal aortic aneurysm (AAA) screening on the NHS. The AAA screening patient decision aid website aims to help men aged 65 and over understand the potential benefits and risks of screening so they can decide if they want to be screened based on the available evidence. 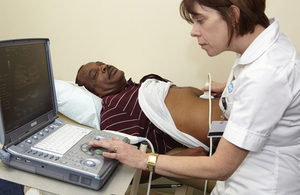 The NHS AAA Screening Programme invites all men registered with GPs for ultrasound screening during the year they turn 65 while men over 65 who have not previously been screened can self-refer. GPs are informed of all screening outcomes for men on their lists. Informed decision making is particularly important for AAA screening given the risk that a man could die or suffer serious complications following surgery to repair a screen-detected aneurysm. We need to explain screening so the public can make informed choices – understanding there may be risks as well as benefits. The evidence clearly shows that screening 65-year-old men at a national level will save lives. However, for individual men it can lead to important decisions about having surgery, which has an inherent risk. The AAA screening patient decision aid is another resource that will help to ensure men are given information in a supportive way that enables them to choose to be screened – or not. The decision aid has been developed by the NHS AAA Screening Programme in conjunction with the National Shared Decision Making Programme and is based on data from the largest randomised trial – the Multicentre Aneurysm Screening Study (MASS). A printable pdf version of the resource is also available on request for people who do not have internet access. Additional information for GPs and other health professionals is also available in the form of a double-sided A4 information sheet that can be downloaded from the NHS AAA Screening programmes website. If you have any queries about the AAA screening patient decision aid, please contact the NHS AAA Screening Programme at aaa.screening@nhs.net. 21 January 2014 Change to editor's notes. 21 January 2014 First published.